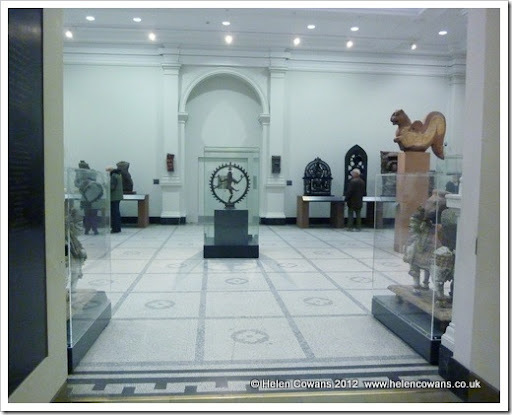 Saturday morning and all was quiet in the Medieval Galleries at the V&A museum. Unfortunately at this point my camera picked up some dust. Classy, civilised and well educated dust maybe, but a pain in the *** dust. Below are two small items which caught my eye for their shape, colour, design and pure craftsmanship. Who wore them? Where did they go? What did they see and hear? Fastener 500-700 CE. 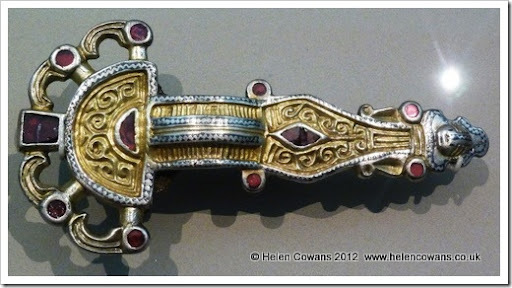 Silver, partial gilded, with garnets. Northern France. Gold, silver, bronze, garnets and shells. England. Tunics; Childs 450-650, Adults 670-870. One and a half THOUSAND years old. 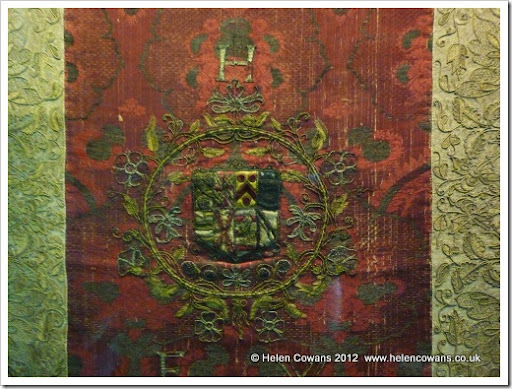 Mind blowing to see textiles of such an age and in such good condition. I stood and looked for quite a while. The next room I found by mistake as I was trying to get from A>B (as it turns out I couldn’t as it was locked and had to go via C,D Z and E). Its the only room I loved and hated in equal measure. This is the National Art Library. Such wonderful old books looking totally wrong with the modern art. My fingers were itching to open these. You can access the catalogue here. 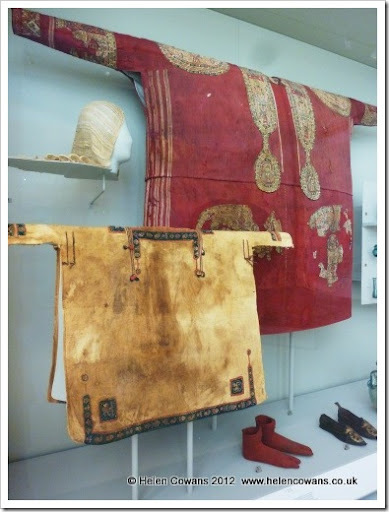 From books back to textiles and costumes. 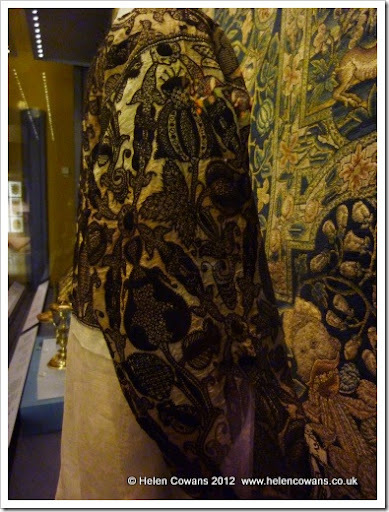 I give a talk on the “Story of Silk” and have always been intrigued by this exotic fabric. Excuse the light, it was very, very dark in this room. No, that’s not quite true. It was very, very, very ,very dark. 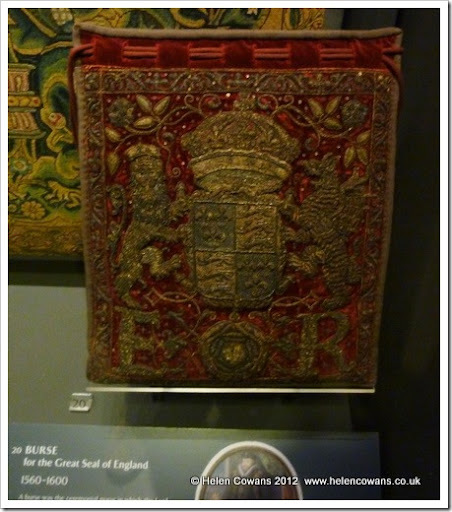 Burse for the Great Seal of England. 1560-1600. 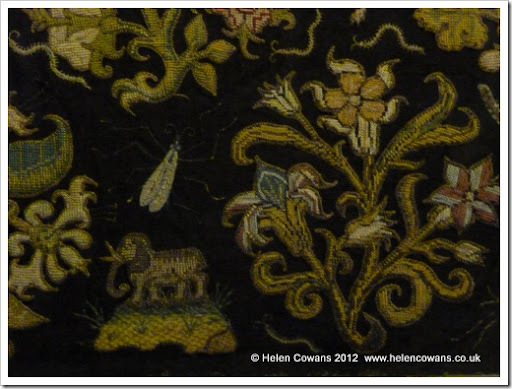 Silk velvet with applied linen canvas, embroidered in silver and silver gilt, silk, sequins and beads. This piece of embroidery has long been a favourite and despite the very dark conditions I wanted to get a photo. Of all the textiles in the museum this is THE piece of embroidery I would take home. It would look good in my red/gold sitting room. Elizabeth I might even have handled this. What tales could this item tell? A better photograph is available here. 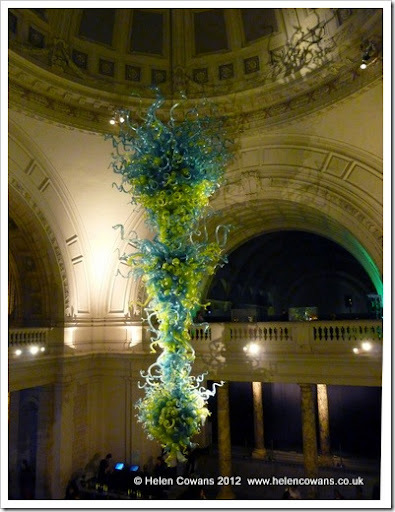 That’s its for the V&A, for now. But all being well I’ll be back in the spring to see this. More information on these amazing sculptures here. 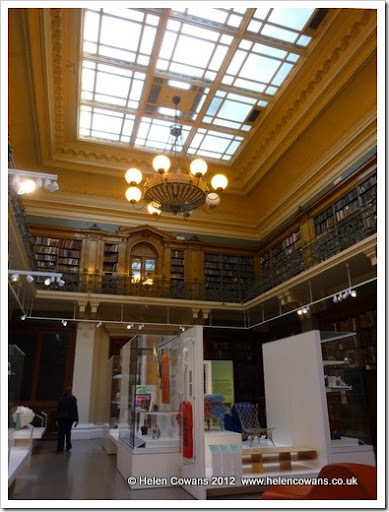 After taking the online course on the History of Indian Art it makes it easier to understand the context of the items seen in (the rather sterile) context of the museum setting. As the MA is financially out of reach atm I’m considering signing up for the Islamic Art course next, but that’s another story. I love looking a the the shapes and patterns. 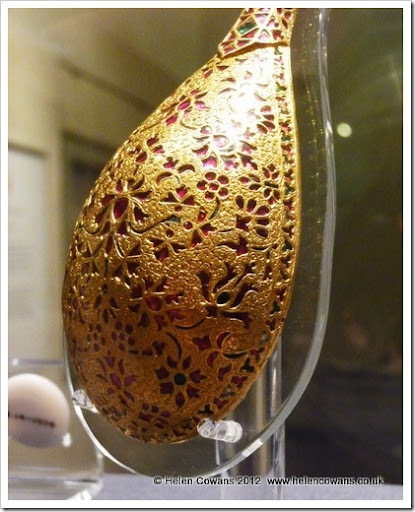 I find this Eastern Art is just so beautiful and pleasing to the eye. The Jina Rishabhanatha, Uttar Pradesh, Northern Indian. 800-900. 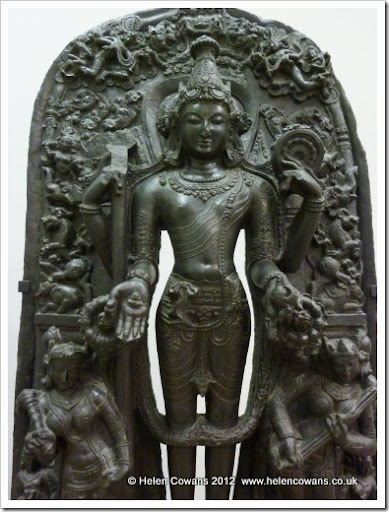 Vishnu. 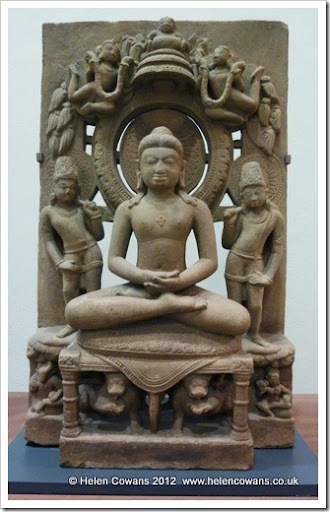 Eastern Indian or Bangladesh 1100-1200. 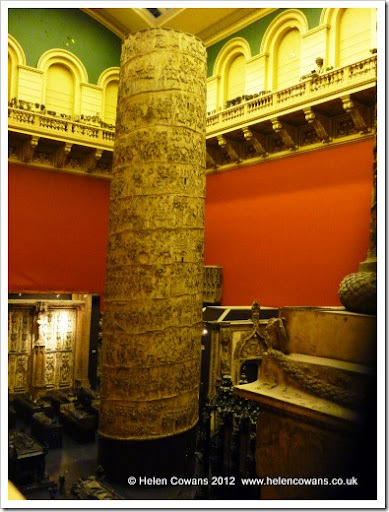 The journey continues from India to Old Britain….. 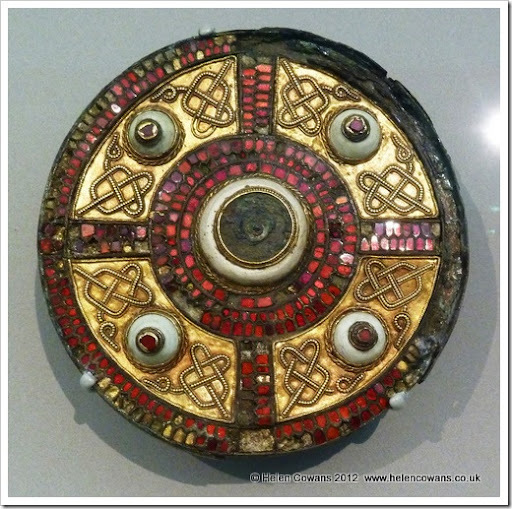 The British Galleries contain some super objects, so important in the history of Britain. Leather gloves with silver and silver-gilt. 1615-1625. Head Cloth for a Bed. 1554-1575. 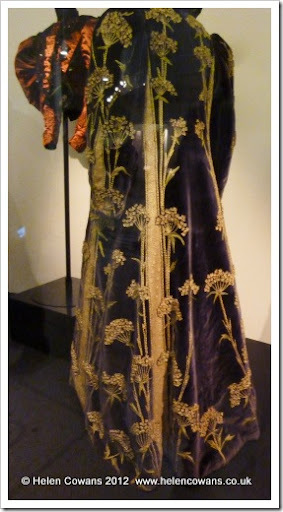 Woven silk damask, silk and metal thread. For the wedding of Henry Wentworth and Elizabeth Glemham. Long cushion ~1600. Silk velvet with applied linen canvas. The label reads “Patterns composed of isolated motifs such as these were almost exclusively English and owed little to outside influences”. Elephants? In Elizabethan England? In the Tower menagerie maybe. Linen with silk in Blackwork style. Almost 500 years old. How utterly amazing is that? The V&A has beautiful views around every corner. 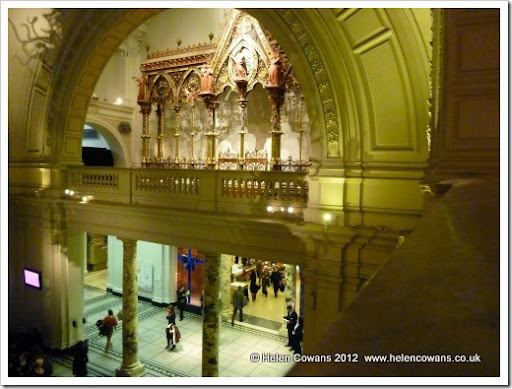 Only the V&A could give you a view such as the above. The Friday I was there was a “late night” opening until 10pm. It was a wonderful atmosphere and though not all the galleries were open it felt special to be there after hours – and NO KIDS! Each time I visit the V&A I come across something new – this is the Cast Court, looking down from a balcony as I was on my way to the Ironwork section I couldn’t believe this sight. 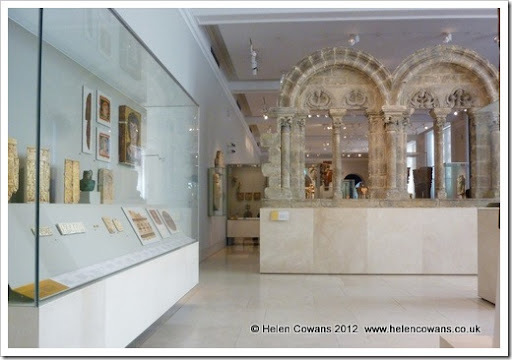 Can you see how quiet it was in the galleries? In that time between the schools leaving and the workers arriving, it was magical. 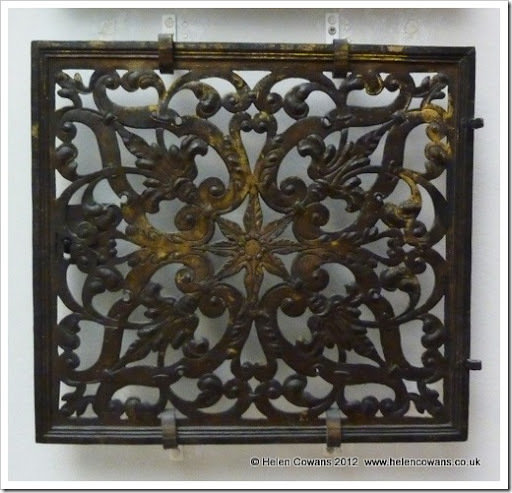 This is a Grille, Copper Gilt, Italy C16th, said to be from Venice. There is a beauty in all items here. (See more of his work in museums here). Around 8pm I wandered a few minutes down the road to the Natural History Museum. I had a wonderful evening here too. 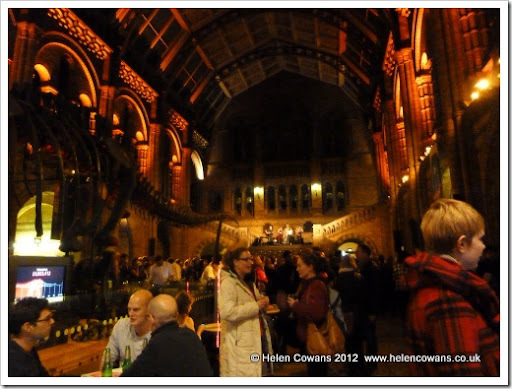 Had a look around the dinosaurs gallery (again no kids – pure bliss), the atmosphere was wonderful with the bar and band. The Wildlife Photographer of the Year exhibition was busy but a stunning display of photography, I came away inspired to capture the animals of Northumberland as well as the landscape. Though I wondered what Darwin would make of all this as he sat on his chair behind the band? The morning view of Kensington was very different to the usual view of garden and fields. These chimneys caught my eye. A huge number per house. Back to memories of London. I’m not sure where the last week has gone….. its just… erm…. well… gone I guess! 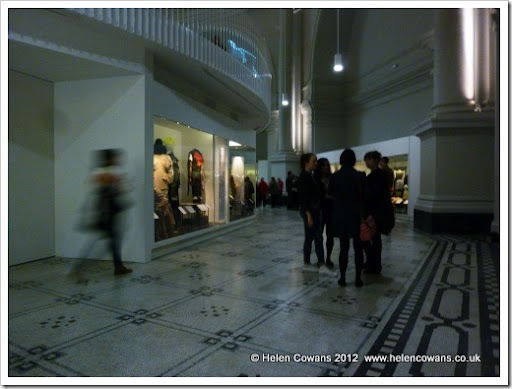 At the V&A I was really excited to visit the new Fashion Galleries. Beautifully set out, rather dark, so please excuse the dim and wobbly photography. 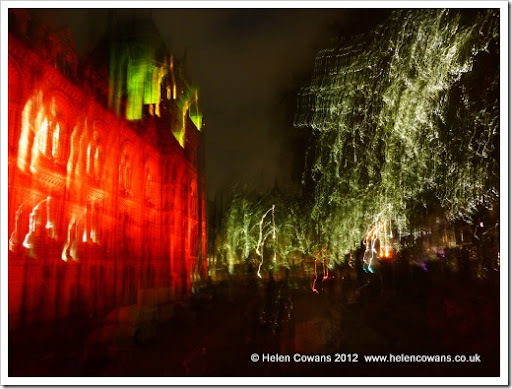 Here’s a small selection of my pictures. Even photos that aren’t quite sharp are enough to trigger the memory, along with sketches and thoughts its a great inspiration. Part of his last collection, digitally printed with an image from a German altar piece. (I always photo the information plate before I photo the item too). 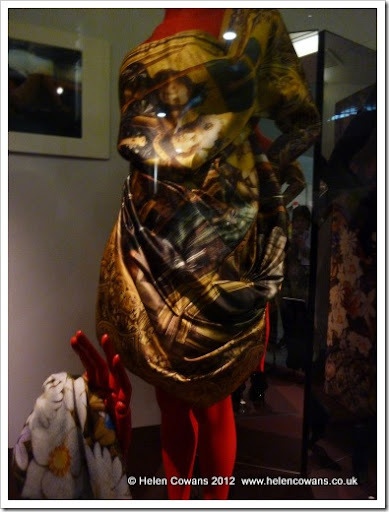 This dress was stunning and I must make some of my own clothes using digital imaging. I’ve long admired this garment, its in a book which was a present from DH a few years ago. 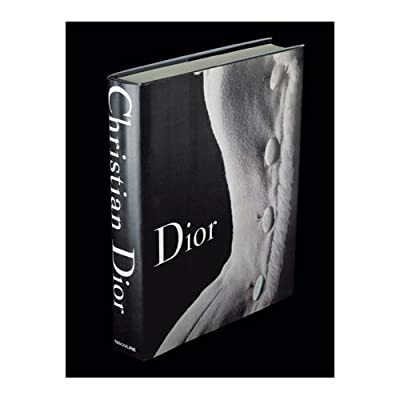 I have just looked up the reference on Amazon and can’t believe the price. I know it wasn’t cheap at the time but now there’s an extra “1” in front. What an investment piece (! – get it? couture?, investment piece, yes I know I’m sad). I shall tell DH that books are a wonderful way to invest money with a huge % return and we must buy more! No, I don’t think he’ll run with it either! I really, really could wear this outfit. Well, not literally of course as I’m a good few dress sizes too large, but its my colour and shape. I love the shoes too. Seeing the inside of garments is almost, if not more, exciting than seeing the outside. Ribbed silk and silk satin lined with cotton and whalebone. 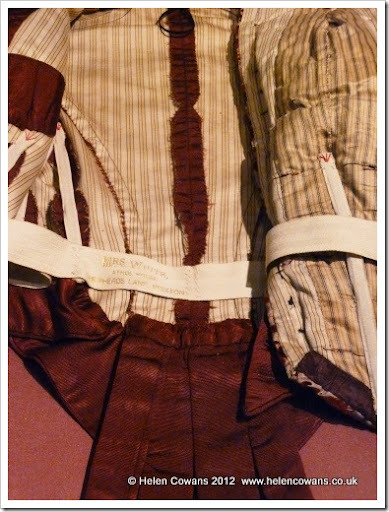 Its also interesting to see how the undergarments played such an important role in the shaping of the outer garment. 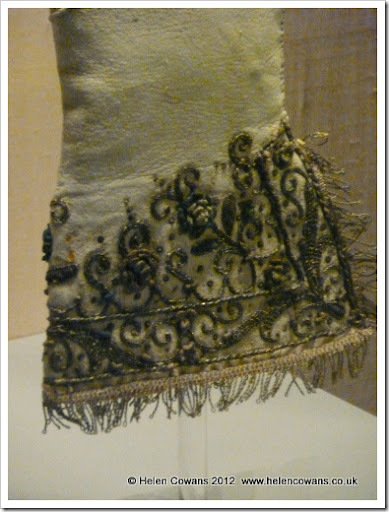 Note the sleeve support from 1825-30, cotton filled with feathers. 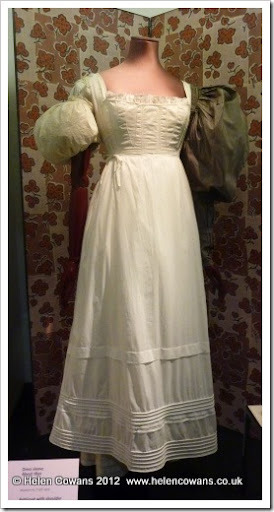 The chemise is 1835, linen trimmed with cotton. The clothes were displayed beautifully. My only complaint is that there were far too FEW on display. 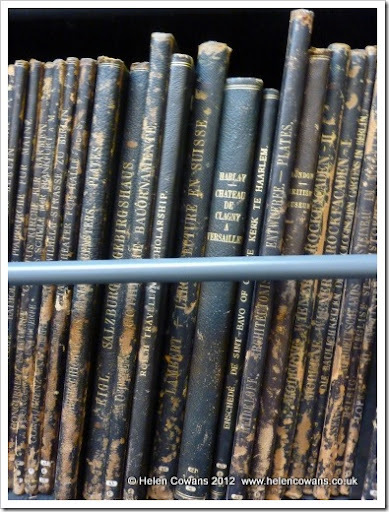 I wish I could get to see the archives sometime. 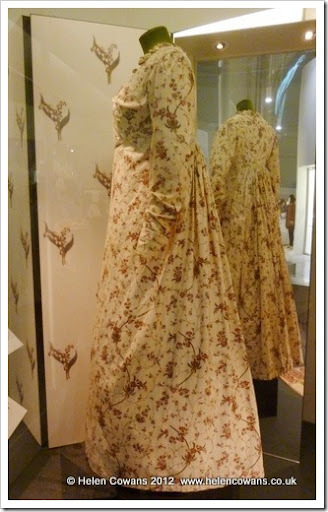 This is a Day Dress 1795-1900. Block printed cotton. 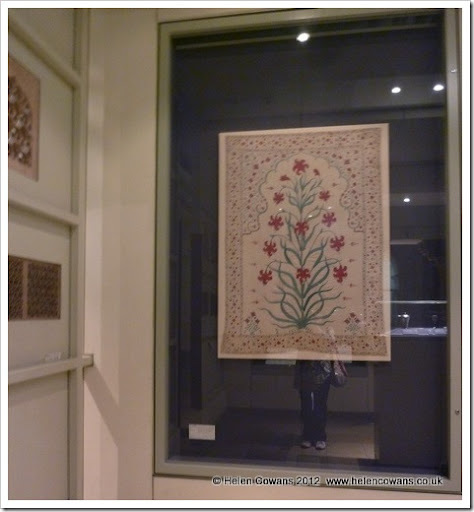 This is the time when embroidery on cloth was superseded by block printed cotton from Indian. I’m not sure whether to be sad that embroidery rather died, or to be glad to see the beautiful block printing from India. This is another garment I’ve long admired. I stood for a while sketching this item, as its only by sketching that you truly see. I no longer care what people think of me, nor what they think of my sketch book when the look over my shoulder (not hard at my height). This glorious sumptuous costume is an Evening Coat by Marshall and Snelgrove 1895-1900. Velvet embroidered with silk thread and wool felt. Yes, I can see me wearing this too. I’m often told I should be making things for myself. So lets see what I can do this winter. This is sure to be great inspiration. 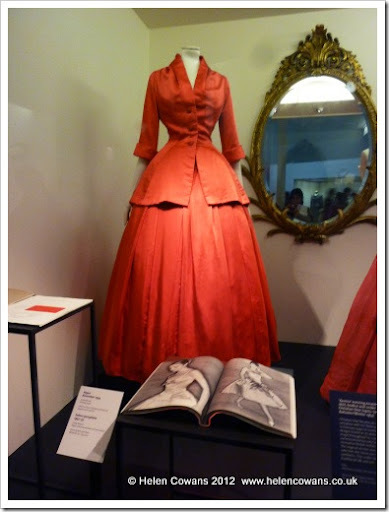 I also visited the Ballgowns Exhibition where no photography and most annoyingly, no sketching was allowed. The “no sketching rule” really annoys me. I won a free ticket to this on Facebook. It was a great excuse for a London visit. 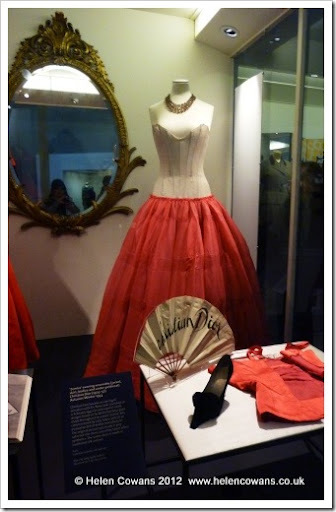 If you want to see more go and Google “Ballgowns V and A” and click on “Images”, you’ll see the exhibition online. When I’m at the V&A I always end up in India. You can see me here in comfortable trainers, sketchbook clasped between my knees. Again I’ve admired this image in numerous books, but seeing something for real is so, well, special. If I ever do get to India I think I may be overwhelmed and have a total meltdown not knowing where to look or what to photograph! Mughal Hanging Late C17th, cotton embroidered with silk. And jewels of course…Mughal c.1600. Gold engraved and set with rubies,emeralds and diamonds. 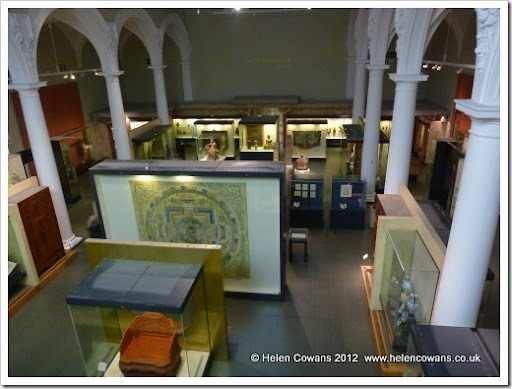 Next instalments – more of India then the British Galleries at the V&A followed by the Natural History museum at night and then onto Tate Britain. All coming soon to a Blog near you. 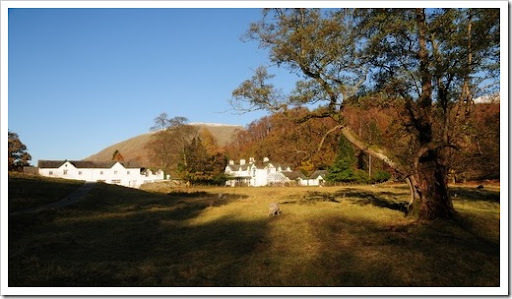 Have had a fantastic week at Grasmere. It was like being in a wonderful parallel universe. Great company, lots of laughs, delicious food and fabulous surroundings. Inspirational friends, motivating DVD’s and a beautiful view from every window kick started the art/design process and resulted in the plans and ideas being formed for two new series of works. One full of colour, vibrancy and pattern. The other project more subdued, sketchy and the colour of the Northumbrian moors. That should keep me busy for the winter. Back to London again. For so many years I was too ill to travel to exhibitions however this year I’ve been able to visit twice. (Please, please – if you are female, feeling shattered and ill, INSIST on an early menopause assessment. Its quite hard not to be distressed that the medical profession wouldn’t listen to me years ago). I had a short break of two days, leaving Berwick on the 8.11am train arriving at 11.54am. 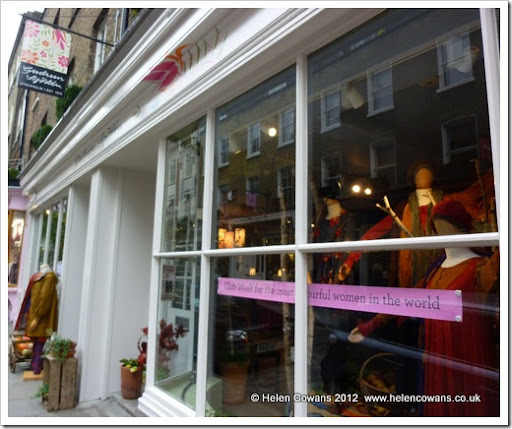 I took a taxi to Monmouth Street and headed into this shop. I’ve waited a long time for this! I love their clothes but the sizing can be unpredictable so it was wonderful to grab a handful and try them on. There was also a 20% off for 3 pieces offer, how could a girl resist. I’m not sure about the tag line “for the most colourful women in the world” as I came out with mostly grey and black pieces! I walked to Leicester Square, headed out again pretty quickly and decided to walk down the Mall. 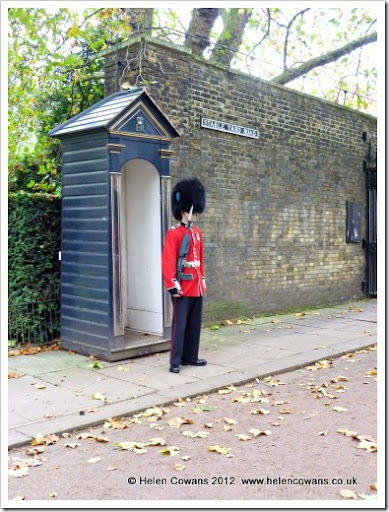 One of the things I love about being a tourist in London is walking, looking and exploring. The history hidden down little lanes and behind walls is amazing. 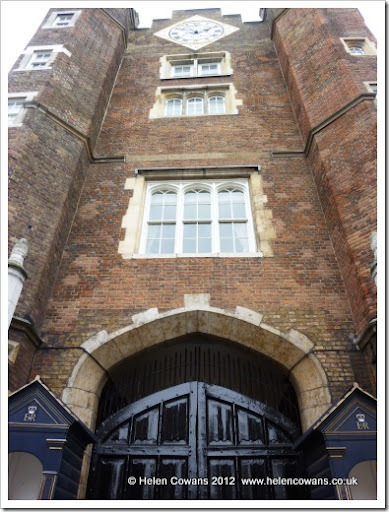 This is St James Palace, built by Henry VIII. More info here. I saw a group of tourists taking a picture and I joined in. These poor guys must get so fed up! 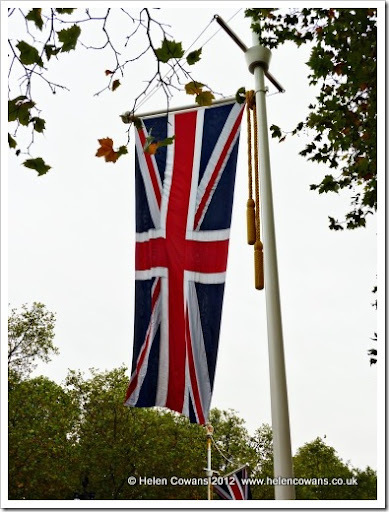 As I walked down the Mall I loved seeing the flags and I felt proud to be English… British….. English. 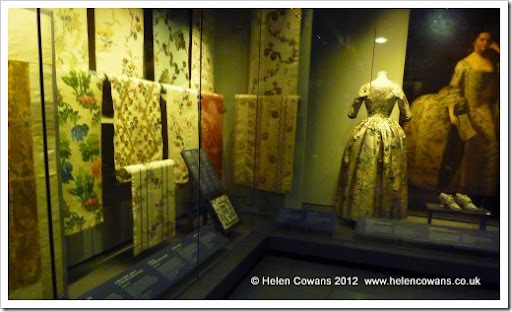 More later on the museums and exhibitions – I need to get the pictures processed but just now I need to pack to get to Grasmere for a week of stitching!!! Yippee!!! !